Not long ago the idea for a local theatre company was a twinkling in the eye of Carlos Garcia, then there were active dreams, then brainstorming, planning, and last Spring the EVR launched with two new bi-lingual play readings. And now the EVR is back with an exciting program of short new theatre pieces written by, directed, and acted largely by East Valley community members. Playwright Laura Aranjo and EVR Artistic Director Carlos Garcia prepare scripts for auditions. 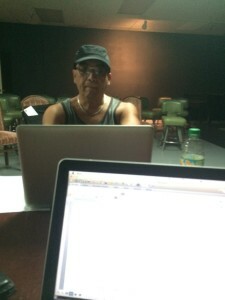 Carlos and David G – dueling, (actually collaborating) computers during a strategic planning session. East Valley Rep, a new theatrical venture located in the eastern end of the Coachella Valley, will launch its first full production, “Tacos, Teardrops and Tequila,” a Ten-Minute Play Festival, on September 25 and 26 at 7pm at the Coachella Valley Art Center, 45140 Towne Street, Indio. 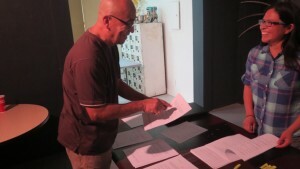 Seven playwrights participated in playwrighting workshops in August creating seven ten-minute plays addressing issues such as abortion, mental illness, immigration, Alzheimer’s, funeral planning, veganism and homophobia. “Some are funny, some are sad, but all are entertaining and they demonstrate the talent of Coachella Valley residents,” said Garcia. 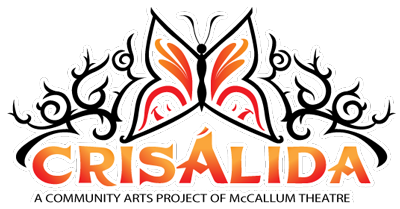 The writing workshops were supported in part by the Crisalida Arts Project, which is spearheaded by New York performer David Gonzalez in partnership with the McCallum Theatre and funded through a grant from the James Irvine Foundation. Mr. Gonzalez will be moderating a Questions and Answers session immediately following the performances. Tickets for the festival are $10 per person. It is recommended for mature audiences only. The material is not suitable for children. Please contact carlos@eastvalleyrep.comto make reservations or for more information about the program and/or the theatre company.